Global environmental change and recent worldwide infectious-disease outbreaks make the ecological perspective of medical anthropology more important a field of study than ever. 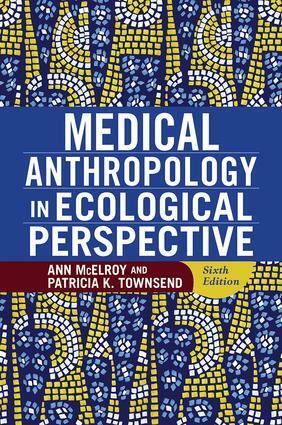 In this premier teaching text, authors Ann McElroy and Patricia K. Townsend integrate biocultural, environmental, and evolutionary approaches to the study of human health, providing a complete and authoritative ecological perspective that is essential for interpreting medical anthropology. Research by biological anthropologists, archaeologists, and paleopathologists illuminates the history and prehistory of disease, along with coverage of contemporary health issues, both local and global. This sixth edition is thoroughly revised and updated, with expanded discussion on the interaction of environment and infectious disease; new material on climate change, globalization, and the effects of war on physical and mental health; and an entirely new chapter on ethics in community health and medical anthropology. Medical Anthropology in Ecological Perspective captures the essentials of the discipline and covers its ever-changing topics, trends, and developments in an engaging, accessible way.